Our editors and contributors would like to wish you and yours a happy, healthy and safe holiday season. We'll be enjoying the few days with friends and family, but will be back next week with some 2010 round-up posts as well as a holiday "What We Drank." Do you think it's appropriate to put a Rugrats commercial on before 8 p.m. that uses words like "jerk" and "poopy" right after Diego and before Backyardigans? I thought you were for pre-school kids. Today is a big day for our friend and managing editor, Evan Dawson and we couldn't be prouder or more excited. His book "Summer in a Glass" is finally available for pre-order and he launched his new book-focused website today as well. Check it out today to learn more about the book, read a sample chapter and find out how you can order your copy today. I've read it already and I can't recommend it enough. If you're a reader of this site, you already know that Evan is not only an excellent writer, but is also gleefully afflicted with an uncommon, energetic love for wine. With this book, he reminds all of us that wine isn’t just fermented grape juice on a store shelf. It is a confluence of people, place and passion, and he take us inside the lives of those who put all of themselves into the bottles we uncork every day. Whether you’re a wine geek or are new to wine, this book will leave you thirsty -- not only for Finger Lakes wine, but for more tales of love, loss, frustration and redemption. Congratulation, Evan. You've been working long and hard on this book for years -- it's a pleasure to see it come to fruition, and be such a great read. You'd better get working on that sequel. The publisher is going to want one. Watch the book trailer above and then head over to the website to learn more. The origin of the term "red tape" is generally assumed to come from the 16th century, when Henry the Eighth wanted so desperately to have his marriage annulled that he flooded the office of Pope Clement VII with roughly 80 petitions. Each document was sealed and bound with red tape. I share this story because the days of Henry the Eighth might seem long past, but it has been roughly that long that David Sparrow has been wading through his own series of documents and petitions, bound only metaphorically by red tape. But here's where the similarities end. Because while Henry never got his papally blessed annulment, David Sparrow got his Finger Lakes Wine Center. Finally. "We prevailed," Sparrow told me. "Creating the center took far longer than we anticipated. We're relieved and delighted to have launched our beautiful facility." Sparrow, owners of Sparrow's Fine Wines, will only speak vaguely of "bureaucratic frustrations," because he's focused on the future now. The Finger Lakes Wine Center is open in Ithaca, and as president of the board, Sparrow is spreading the gospel. "We want to establish the center as a focus of exploration of cool-climate viticulture," he said, while noting that for now, the center's goals are more modest. "Financially, we want the center to succeed in supporting itself -- that's absolutely essential. Programtically, we want to introduce the nearly 900,000 visitors to Tompkins County each year to the wines of the region, and to increase demand for these wines." Sparrow sees that as a way to stimulate development across the region in agriculture and tourism. So let's answer the question: What is this place? Aesthetically, it is, in a word, modern. The sleek design includes a large regional map and educational illustrations, including a diagram of local soils that contribute to a Finger Lakes wine's sense of place. Visitors first walk through a kind of wine and retail shop, which flows into a wide open space featuring, on the far side, a wine bar. Then there is a room for private meetings, parties and events. The wine bar serves several dozen wines for small tasting fees. On Thursday nights, local bands provide music. 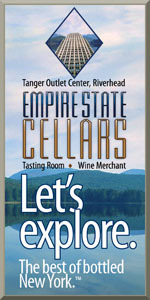 Sparrow wants the Finger Lakes Wine Center to be viewed as a hub of wine education and enjoyment. And despite nearly a decade of wrangling with politicians, Sparrow explained that the main goals have remained the same. "The vision of the task force and the corporation was to create a facility to receive and educate residents and visitors about the region’s wines," he said. "The center’s operations were to be self-supporting through revenues from sales of tastings, wines and other retail goods, rental of its space for receptions and parties, and fees for seminars and demonstrations. That is the present vision too." So everything works together -- the retail shop, the tasting bar, the event space. Money generated helps ensure that the center can sustain itself while staying versatile. Local wineries have offered a largely positive reaction. Some have declined to submit their wines for the tasting bar, but Sparrow sees progress. "The wineries have been very supportive," he said, "and we continue our outreach to them." When I visited on a recent Saturday, the tasting bar staff explained that occasionally winery owners have expressed confusion about the overall purpose of the center -- but have come on board after hearing that the main goal is wine education and increasing tourism. There is no restaurant, and the site is smaller than the New York Wine and Culinary Center in Canandaigua. Staff at the Finger Lakes Wine Center don't seem concerned about carrying a similar name. Sparrow told me that even after one month open, the signs are positive on the financial end. "We've opened at the beginning of the slow season, but we needed to do this now for a number of financial and other reasons," he explained. "Rental demand for the space has sharply exceeded our initial forecast." Groups can rent the center for $600 and choose between a sit-down experience in the exhibit gallery (the main public space) for 100 people or a cocktail reception for 250 people. The private conference room offers seating for 14 people and rents for $100 for two hours. I found the vibe to be young and upbeat. The oak barrel tops on the wall and the educational drawings are a nice touch. The wine list carries some -- but not all -- of the best bottlings from the region. Sparrow expects the wine list to grow. For now he is thrilled to have the center open, after needing what must have felt like a papal decree. He has it, and it will be interesting to see what he does with it. With the accelerating success Long Island wine has enjoyed in recent years, it's easy to forget that the industry was only founded in 1973. Several grapes have come and gone over the course of 30-plus years -- zinfandel was even tried early on -- and a handful of grapes have emerged as those showing great promise here including merlot, cabernet franc and sauvignon blanc. For a variety of reasons -- and with a few notable exceptions -- variety experimentation has slowed in recent years, but Palmer Vineyards and winemaker Miguel Martin aren't done exploring. This fall, they harvested just over four-tenths of a ton of Albarino from an acre of vines they planted in 2007. It's not surprising that the Spanish-born Martin would want to try Albarino, but it goes well beyond his heritage. "I think Long Island may be blessedwith the kind of conditions perfect for the production and growing of Albarino," Martin told me "Because of the similar weather patterns." The weather on the North Fork may be similar to that in Galicia, as is its proximity to the ocean, but Martin concedes that the topography is quite different "Most of the Albarino is planted on the high slopes near the coast (there)." Still, Martin is confident that Albarino will ripen consistently here and it certainly did in during the hot, dry 2010 season, coming in on September 11 at 22.0 brix and 3.15 pH, without any issues in the vineyard. I have yet to taste the finished wine, but Martin is happy with the early results. "I am very excited about the future potential of this variety in Long Island. This wine is full of character with bracing acidity and saline minerality wit aromas of citrus and white flowers. Albarino is a great food wine. 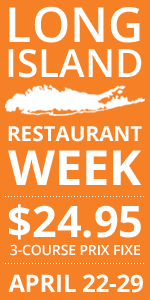 It goes wonderfully with our local seafood." The wine will be released in the spring, but isn't expected to last long. Martin was only able to make 50 cases of 500 ml bottles. When I asked him why it's important for wineries to continue to experiment with new varieties, he answered simply "Because you open the door to try and produce new and exciting wines." He's planted muscat and malvasia bianca as well -- both of which he's enthusiastic about producing either as stand-alone wines or as blending components. At this point I think everyone has heard about the hit reality show “The Fabulous Beekman Boys” that airs on the Planet Green network. But, for those of you who are not familiar, it follows the lives of two men -- Josh and his partner Brent -- who decide to lead the lives of farmers, explore the merits of sustainability, and develop their various products and lifestyle brand of Beekman 1802. On a working farm in Sharon Springs, NY, Josh and Brent are raising a dozen chickens, a couple of pigs and approximately 80 goats. One of the byproducts of raising goats is an ample supply of goat’s milk which in turn, lends itself to making cheese. After doing a bit of research and with some assistance from the local creamery at Cooperstown Cheese Company, the Boys started producing cheese from their goat’s milk. Not happy with the acidity and sharpness of an aged cheese made purely from goat’s milk, they decided to mix in some cow’s milk (60% goat/40% cow) to add a layer of complexity and round out the flavor profile. The cheeses are aged for approximately four months and then “blackened” on the exterior with a hardwood ash. Although some traditional chevre and soft goat’s cheeses do incorporate vegetable ash (think Capriole’s “Sofia”), the rinds on aged varieties are usually left to their own devices, with perhaps some washed encouragement from the affineur. The result here Beekman "Blaak," a dark and textured 2 lb-wheel, with a hint of smoke on the nose from the exterior ash. With all of the hype surrounding the show and the Beekman brand, this cheese was popular right from the outset. Even before people had a chance to try this cheese, they wanted it. I have now had an opportunity to try this cheese on two separate occasions from two separate wheels with two different groups of people, and the cheese has left me, for lack of a better word, wanting. Visually, this is a gorgeous wheel. The blackened ash completely coats the rind and enhances the textures that are present from the basket molds used in making this cheese. It is definitely a conversation piece to have this cheese on your board as the contrast between the pale paste and the dark rind is quite stunning. But, after letting the cheese come to room temp, I didn’t get anything on the nose beyond the smoky hints from the wood ash that coats the outside. I actually thought it was a bit overpowering. What disappointed me -- on both occasions I might add -- was the lack of flavor or complexity. When combining cow and goat's milk, I expect a cheese that marries the tangy bite from the goat’s milk with a mellow and rounded creaminess from the cow’s milk. Blaak didn’t provide that for me or for the others that were tasting this with me. This cheese is incredibly mild which isn’t necessarily a bad thing if that is what you are looking for. Personally, I look for pronounced and unique flavors, a nice balance of salt, and overall complexity. This cheese may contain some of those elements, but they are muted to the point of being nearly absent. In looking at my fellow tasters (two cheese shop owners for one tasting, and a certain founder of a respected New York wine site for the other), we had that same look of recognition on our faces after trying a couple of pieces. This cheese is made by people who are on TV! Every major shop in the Northeast wants this cheese! So…why don’t we like it? I can’t really answer that question. Sometimes hype, fame or reputation may cloud objectivity in trying something for the first time. That is the main reason why I wanted to try this cheese again from a different wheel, in a different location, with a different group. Was it just me? No. Now it sounds like I didn’t like this cheese on any level. I am not saying that at all. I just think there is vast room for improvement. I look forward to seeing how the Beekman brand and “Blaak” evolve over time. In a wine world filled with so much ubiquity, it is a true pleasure to find a wine like Channing Daughters Winery 2008 Meditazione ($40), a wine inspired by the “Vino da Meditazione” wines of Northeast Italy -- be uniquely Long Island through and through. A blend of 27% sauvignon blanc, 27% chardonnay, 16% Tocai Friulano, 16% muscat ottonel and 14% pinot grigio, this wine falls into the "orange wine" category -- a white wine made using red wine techniques. All of the fruit was hand-harvested from their estate vineyards in Bridgehampton. It was then de-stemmed and the grapes were fermented together on their skins for ten days in an open-top fermenter. After fermentation, the wine then spent 18 months in 63% new and 37% old/neutral French and Slovenian oak. The resulting nectar is a wine to savor and ponder over the course of an evening -- just cooler than room temperature. Layered and complex, the nose smells of dried apricot, fresh peach, lightly smoked black tea, roasted nuts, dried orange peel and citrus blossom. On the fuller side of medium bodied, the palate shows beautiful intensity at 12% abv. The flavors range from dried apricot, black and herbal tea, roasted nuts, straw and Bosc pear skin. It's dry, with an almost Sherry-like salinity, noticeable skin tannins and citrusy acidity -- all with a long, fresh finish. As I do with most of the wines I review, I tasted this over the course of three days and a really interesting wintergreen note poked through on the palate on day three. I'm not sure what I'd eat with this uncommon wine, but I'm thinking that a variety of harder cheeses and cured meats would work well. With the opening of their second (and now main) tasting room on Main Road in Jamesport, Sherwood House Vineyards is starting to get more of the attention it deserves. Yes, owners Charles and Barbara Smithen still have their rustic little vineyard-side tasting shed between Route 48 and Oregon Road, but that's an un-heated and therefore seasonal location. The wines are all made by Frenchman Gilles Martin, who also makes wines for Bouke, Sparkling Pointe and the non-pinot wines for McCall Wines. Made with estate-grown chardonnay, the House of Sherwood 2005 Blanc de Blanc ($37) offers intense bisquity aromas with those of apples, straw, honey and spicy lees. Anything but delicate, the palate is filled with roasted tree fruit -- apple and pear -- flavors with nice yeasty dough notes and spice. Dry but nicely balanced, this sparkler delivers a long finish with apple skin character. I liked 2004 for a bit more, but this is still a winner. Grape growing dates to 1677 in the Hudson River Region AVA, but that doesn't mean that its an easy endeavor. Yes, the river that gives the region its name helps moderate the climate, but it's not nearly deep enough to have the same effect that the Finger Lakes do to the west. It rains a lot in the Hudson Valley. It's also humid. And like the rest of New York, it's a cool-climate region with a relatively short growing season often with early and late frosts on either end. Growing grapes, particularly vinifera, can be a challenge in the region, and many of the vinifera wines you see at local wineries are made with fruit or juice from Long Island or the Finger Lakes. This Millbrook Vineyards 2008 Block Two West Chardonnay ($35) is the rare locally grown chardonnays that has crossed my tasting table. The nose shows strong barrel (and 100% ML) influence in the form of vanilla, butterscotch and caramel with dried apricot, peach and distinct Bit-o-Honey candy notes. Medium bodied with nicely balanced acidity, the palate offers gentle creaminess and a bit more pear, rather than peach, fruitiness behind the butterscotch and honey flavors. When allowed to warm to nearly room temperature some vaguely brioche-like flavors emerge, as do apple skin notes. Though a bit dilute and hollow on the mid-palate, this chardonnay shows good length and balance. What would you do if you looked in your wine cellar and realized you had a vertical of a particular wine? If you're like my friends Jared Skolnick and Tracy Ellen Kamens, owners of Grand Cru Classes on the North Fork, you throw a dinner party for 12 and open them together. And, you invite the winemaker, who graciously offers to bring a few more vintages, including the first ever made. That's how I found myself sitting with local winemakers and wine industry folks Sunday night at Jared and Tracy's wine education center with eight vintages of Channing Daughters Winery L'enfant Sauvage Chardonnay -- 2001 through 2008 -- in front of me. As we tasted the wines, accompaniment by a delicious meal prepared by our hosts, there were discussions ranging from "natural" winemaking to packaging and closures to the homogenization of sauvignon blanc because of yeast choices. The eight chardonnays in front of us, all fermented in new french oak without inoculation --thus the name "Wild Child" -- were the stars of the evening. The oldest wines weren't just holding on, they were thriving, showing far more life than I expected while also showing beautiful complexity. In fact, the focused, surprisingly fresh 2002 was my favorite of the lineup and tasted like it could develop for another decade, not just survive. The 2001 was a bit less lively, but stood out because of an intriguing earthiness akin to fresh truffles or truffled cheese. What impressed -- and surprised -- me the most however was how these wines delivered both a consistent, signature style and distinct vintage expression. When we talk about what grapes provide a clear window into the growing season, we usual talk riesling, which does reflect its place acutely so purely. Yet tasting these wines one at a time was a bit like a crash course in Long Island growing seasons. It was fascinating -- a rare treat. As I drove home (after watching the Steelers game in the den), I flipped through my mental catalog of older Long Island chardonnay in my cellar. There is quite a bit down there, dating back at least to 2001. It might be time to start uncorking some.